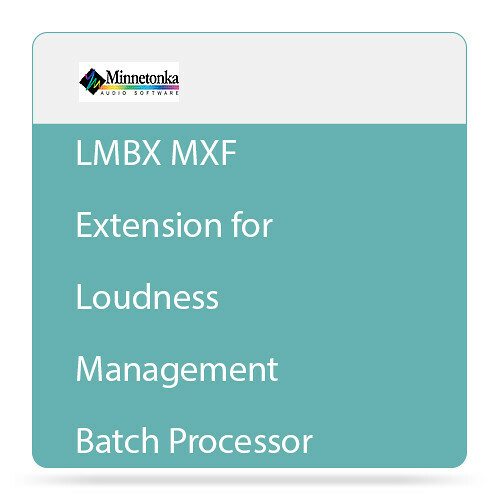 The NuGen Audio LMBX MXF Extension for Loudness Management Batch Processor (Download) is a software add-on to NuGen Audio's LMB software for batch loudness analysis and correction. The extension enables native Windows and OS X handling of files that use a Material Exchange Format (MXF) container while preserving the rest of the data within the file. The extension saves time by allowing LMB to analyze and correct OP-Atom and OP-1a operating patterns with PCM and D10-encoded PCM audio data without having to first convert the MXF files into WAV format. To operate, the software requires a license to NuGen Audio's LMB software, a 2nd generation iLok USB Smart Key, and an iLok.com account.